By pulling out of the Iran deal and reimposing sanctions, Trump has invented a crisis that could push the United States toward war. Donald Trump’s decision this week to violate the United States’s obligations under the 2015 Iran nuclear deal came as no surprise in Europe. French president Emmanuel Macron spent three days in Washington in late April lobbying Trump to leave the accord alone and instead direct his energies toward negotiating a new “grand bargain,” one that would limit Iran’s missile program; penalize its support for Lebanon’s Hezbollah, Yemen’s Houthi rebels, and the Syrian government; and extend some of the deal’s time-limited provisions (its so-called “sunset clauses”). On his way out of Washington, Macron effectively declared that he’d failed to sway Trump. Additional cajoling from British prime minister Theresa May and German chancellor Angela Merkel had no effect either. In the end, all three European leaders reportedly agreed to meet Trump’s demands. It still wasn’t enough. Yet the way Trump chose to pull out of the agreement — by immediately re-imposing all US sanctions that had been levied prior to the deal’s implementation and leaving the door open for additional sanctions beyond that — may have been a bit surprising. Trump had a range of options. He chose the most extreme. If the New York Times is accurate, when Secretary of State Mike Pompeo contacted his European counterparts late last week to inform them of Trump’s decision, he also told them he was working to convince Trump to delay an announcement for two weeks to give US and European diplomats a chance to keep negotiating on Macron’s grand bargain. They believed that Pompeo preferred a softer withdrawal from the agreement, whereby Trump would take some time before re-implementing sanctions. Whatever their impressions might have been, that’s not what came to pass. Macron and company’s reaction to Trump’s move matters, because the survival of the nuclear accord now rests with Europe. Both Iranian president Hassan Rouhani and supreme leader Ayatollah Ali Khamenei have suggested that Iran could choose to remain bound by the agreement — which, in return for sanctions relief, restricts the size and scope of Iran’s nuclear program and subjects it to thorough international inspections — despite US violations. Iran has fully complied with the deal to date, according to the International Atomic Energy Agency. But both Rouhani and Khamenei say Iran will remain party to the accord only if it continues to see some benefit from doing so. Russia and, more importantly, China are likely to continue doing business with Iran whether or not the deal remains in place, though Saudi Arabia may be able to pry Beijing and Tehran apart to some degree. So that leaves Europe as the wild card. As their last-minute attempts to sway Trump show, and their comments after his announcement reinforce, European leaders support the Iran deal both as a way to tamp down tensions over Iran’s nuclear program and because it opens up new business opportunities for European firms in Iran. European foreign ministers have arranged a “crisis meeting” with Iranian foreign minister Mohammad Javad Zarif for Monday to make their case for maintaining the accord. But realistically it will be difficult for Europe not to succumb to US sanctions pressure. 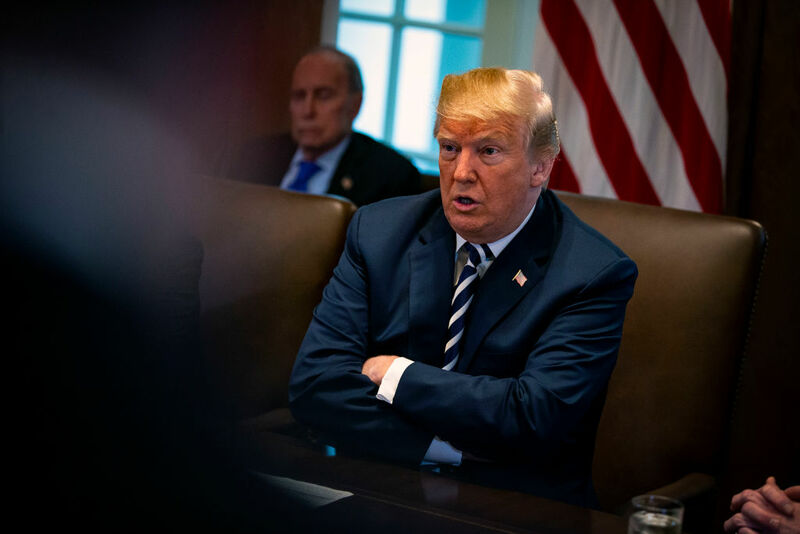 Many of the reimposed penalties are “secondary sanctions,” wherein the United States assumes the right to punish foreign entities that attempt to do business with or in Iran. Firms that disregard these sanctions could be subject to harsh penalties that would lock them out of the US market or, worse, out of the US financial system. While some European companies have made deals with Iran since the deal took effect and sanctions were lifted, access to the Iranian market, relatively small and bedeviled by challenging bureaucratic rules and high levels of corruption, simply isn’t worth the risk of running afoul of US sanctions. European governments could reinstate “blocking statutes” that actually prohibit their firms from abiding by US sanctions, or they could even threaten retaliatory sanctions against US firms. European leaders have begun talking about implementing such measures, but the reality is that they cannot completely insulate companies from US penalties. And the United States may respond forcefully to any European response — the conservative Weekly Standard reported on Thursday that congressional Republicans are already circulating an “external memo” outlining ways that the United States could retaliate against European efforts to undercut Iran sanctions. The other major player in this new, US-manufactured crisis, Israel, appears to be doing what it can to support Trump’s decision. Shortly after Trump’s announcement, missiles suspected to be Israeli struck multiple targets in Syria related to Iran’s military presence in that country. The next day saw an exchange of artillery fire between the Israelis and someone inside Syria, possibly Iran’s Quds Force though Iranian media says it was the Syrian military. That exchange is now being treated in the West as an unprovoked Iranian attack against Israel (never mind that Israel has been striking Iranian targets in Syria for months). These Israeli strikes are meant not to trigger a full-on war, which Israel doesn’t want, but to goad Iran into a response that turns Europe against it and helps ensure that the Europeans lose whatever appetite they might currently have to challenge Trump’s sanctions. The goal, for Netanyahu, is to stuff Iran back into the diplomatic box and, ultimately, to force regime change in Tehran by whatever means necessary. If that means war — so long as the war is between Iran and the United States and not Iran and Israel — then so be it. And if it gives Netanyahu’s polling numbers a boost in the process, even better. The signs of escalation are already mounting. The day after announcing his plan to violate the deal, Trump told reporters that he “would advise Iran not to start their nuclear program.” Does he mean Iran’s civilian nuclear program, or the nuclear weapons program Trump assumes they have, absent any evidence and contrary to the conclusions of multiple Western intelligence agencies? Or is he deliberately conflating the two in order to confuse the issue and make it easier to justify taking harsher actions against Iran? You can expect to see more ambiguous statements coming out of this White House, and probably more “errors” like the “typo” the White House press office made in a press release a couple of weeks ago that changed the sentence “Iran had a robust, clandestine nuclear weapons program” to “Iran has a robust, clandestine nuclear weapons program.” That’s a pretty big difference. Maybe the difference between war and peace.